Django Paris, James A. and Cherry A. 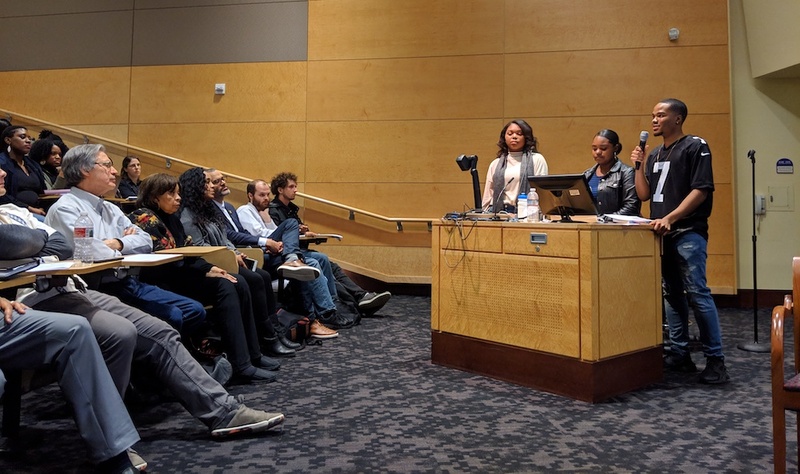 Banks Professor of Multicultural Education at the University of Washington, chaired the presidential session “Centering Us” and also shared the work of the Banks Center for Educational Justice, launched in 2018 under his leadership. “There are people I’ve been learning with for some years who have been involved in center work and thinking about what’s possible, in terms of these institutional spaces, for doing racial justice work, work around sovereignty and resurgence for Native and Indigenous people, intersectional work around thinking about racial justice as it intersects with gender, gender identity, sexuality, ability, disability, with land, with migration, with language,” Paris said. Joining Paris for the session were Sandy M. Grande, Connecticut College; Lawrence Torry Winn and Maisha T. Winn, University of California - Davis; Charles Harold Frederick Davis and Shaun R. Harper, University of Southern California; and Leonie Pihama, The University of Waikato. “We learn both formally and informally from each other what’s possible in an institutional space,” Paris said, from specific programming to how centers link with the various communities they serve. One of the goals of bringing the directors of institutional centers together at AERA is to explore and actualize new efforts for educational sovereignty, justice and liberation. “This is an opportunity to think strategically about what the initiatives are and the community partnerships are across our work and to think about in what ways is our work local, in what ways can it offer connections across contexts, in what ways can we share and build together,” Paris said. During the session, Paris also shared the following video highlighting the work of the Banks Center for Educational Justice. The Banks Center for Educational Justice is a central location for partnerships, program development and collaborative research with early childhood through university educational settings that sustain Native, Black, Latinx, and Asian and Pacific Islander young people across Seattle and Washington state. The center honors long-time UW faculty member James A. Banks, founder and director of the Center for Multicultural Education.